Can Eagles win a Super Bowl with Banner? What took Joe Banner so long to say head coach Andy Reid and quarterback Donovan McNabb would be back next season, as he did Tuesday on Comcast SportsNet? 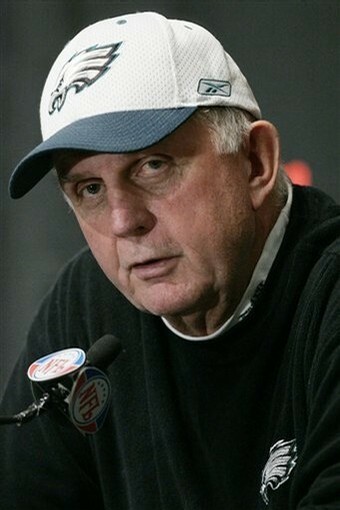 Why didn't he just say so after the Eagles were eliminated from the postseason by the Arizona Cardinals? Banner didn't know. And trust me, it took him more than a week before he felt comfortable putting out the spin, "We can win a championship with those people and they will be back." 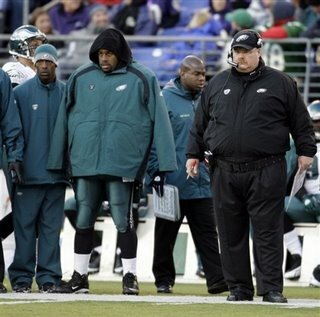 Those people, by the way, are McNabb and Reid. Moreover, Banner is concerned enough about his upcoming face-to-face meeting with McNabb he's spent the week stroking the QB's ego with "we're lucky to have Donovan" plaudits. 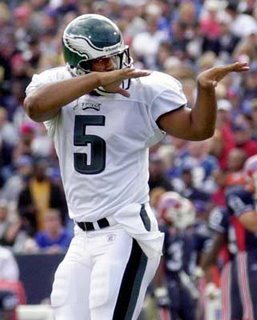 If McNabb asks the Eagles to prove they're lucky to have him, say with a contract extension, Banner's follow-up spin would paint McNabb as too demanding, the bad guy or whatever you prefer to call it. Banner could say, "We always said we were lucky to have Donovan and that we wanted him back and that we think we can win a championship with him. "But there are 52 other players on the payroll and we have to do what's in the best interests of the Philadelphia Eagles." Trust me, there's a lot of bridges to be rebuilt before the Eagles can think about reaching the playoffs next season. This is anything but one of those "and they lived happily ever after" situations. Donovan McNabb can find solace today in the formal inauguration of President Barack O'Bama, who, like the Eagles' quarterback, hails from the great state of Illinois. O'Bama is the first African-American President, and that means a lot to McNabb, who hoped to become the second African-American quarterback to win the Super Bowl. The Eagles' quest fell short Sunday in a season-ending loss to the Cardinals in the NFC title game at University of Phoenix Stadium. To add vandalism to the misery, it appears overzealous fans burned "Go Cards" on the front lawn of McNabb's home in Chandler, Ariz. last week, according to reports. Obviously that's frightening, not at all normal, and really stepping over the line. They say it's the back that hurts Eagles defensive coordinator Jim Johnson, and hopefully that's all it is. Johnson is such a private guy he kept the details to himself after parking his cane for his news conference Thursday. Colleagues won't shed any light on his health either. 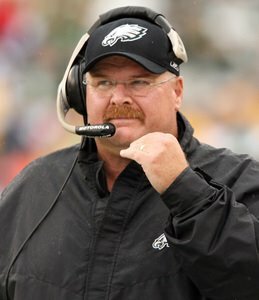 When the Eagles play the Cardinals Sunday for the right to go to the Super Bowl, for the second straight game Johnson likely will be up in the coaches box instead of on the field where he normally resides. It looks a lot like the Eagles' 23-11 divisional playoff victory over the former Super Bowl champion Giants was a first. No other NFL game has ended in that score. And that basically is the story of the Eagles' season. With everything collapsing around them, from the Buccaneers to the Bears, to the Panthers and the Giants, the Eagles still are standing. Believe quarterback Donovan McNabb when he says it's a storybook plot. You cannot script this. Now, about those Cardinals and the NFC title game. They can throw but don't have enough of a running game to minimize the pass rush that antique quarterback Kurt Warner will receive from the Eagles. The Eagles might be able to leave the offense home and still clear the last hurdle to their first Super Bowl appearance since you-know-whose initials were here. Eagles veteran wide receiver Greg Lewis was a healthy scratch for the Giants game Sunday for the first time since his 2003 rookie season. Lewis had played in 98 of 99 games before the move. Also deactivated were tight end Matt Schobel, guard Shawn Andrews, defensive end Bryan Smith, linebacker Joe Mays, running back Lorenzo Booker and cornerback Dimitri Patterson. Yo '5!' You sure no Giants were benched? Donovan McNabb might try to block it out or dismiss it but it looks a lot like he will never totally get over his benching in the second half of the Eagles' loss to the Baltimore Ravens. The trust between the quarterback and the Eagles never will be the same judging by McNabb's insistence on an end of season meeting with management to get answers about the benching and his future with the team. McNabb tried to blow off the benching during his Wednesday presser, calling the Eagles' 5-1 record including a playoff success since getting yanked "coincidental." Asked about the Giants' defense, which hasn't had to play well the last quarter of the season, McNabb surmised "I don't think it's personnel. You know, just sometimes, I guess during the course of the year you don't play as well as you did early on. None of them got benched." If McNabb had checked, he would discover that the Giants made a couple of starting lineup changes defensively. Kenny Phillips replaced James Butler at safety and Corey Webster took over at cornerback for Sam Madison. ... A good team and that the Eagles look forward to the challenge of playing them. "It's a great challenge, a heck of a rivalry and it should be a great football game," Reid said Wednesday of the Eagles-Giants divisional playoff this weekend at Giants Stadium. Held out of practice Wednesday: Offensive tackle Jon Runyan (knee), running back Brian Westbrook (knee) and fullback Dan Klecko (shoulder). L.J. Smith (shoulder) will work back in as the backup tight end. Reid hasn't ruled Klecko out of the game but said Kyle Eckel would work in at fullback. The Eagles put guard Mike McGlynn (torn hamstring) on injured reserve. Reid said Winston Justice, the backup right tackle, would be the first sub at guard. Guard Shawn Andrews, sidelined since hurting his lower back in the second game, willl work back in during practice. "He's been cleared to participate but I'm not just going to throw him out there," Reid said. "He's got to take it one step at a time." As for the often tricky wind at the Meadowlands, which was a factor the last time the teams met, Reid expressed a preference. "I would like it just to blow in the direction I would like it to blow," he said. The Hubert H. Humphrey Metrodome is every bit as loud as its reputation. You can't hear yourself think in pre-game as the Vikings people have dialed up ear-drum breaking music ranging from Wagner to rap. Amid the noise the Eagles officially scratched injured tight end L.J. Smith and defensive end Victor Abiamiri. Unlike last week the Eagles really need the They didn't need the 6-4, 267-pound Abiamiri last week but they really need him today to set the edge against running back Adrian Peterson as well as Tarvaris Jackson, the quarterback most dangerous scrambling. 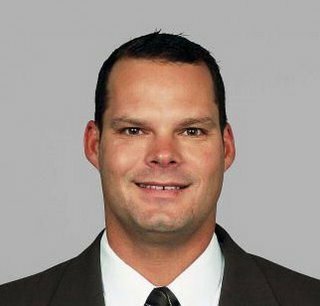 Heckert and Spagnuolo ... to Denver? A report suggesting Eagles general manager Tom Heckert could wind up in Denver with Steve Spagnulo as part of a package deal would make a lot of sense except for one thing. I don't see the Spagnuolo that's deeply rooted in the Northeast moving two time zones away. comfortable with Heckert as a condition of the job, you can book it he'd get him assuming Bowlen wants the Giants defensive coordinator. Broncos officials reportedly met Saturday with Spagnuolo. Spagnuolo might have his pick of jobs in the East and one time zone away in the Midwest, if that's what he likes. He will be a head coach, though. Heckert has a deep respect for Spagnuolo. Had Heckert gotten the Falcons G.M. job last year Spags might have been the coach. Heckert could fit in anywhere. And I think he would flourish with the final say on personnel because he's found precisely the players the Eagles have requested to fit into their system.